Portschinsky, 1871: Trudy russk. ent. Obshch., 10: 175 (Mallota). Typelocality: "Rossia media" .-Distr. : USSR: CET (Yaroslavl and Orenburg regions). = auricoma Sack, 1910, Beil. Programm. W&ouml;hler-Realgumn. Frankfurt a.M., 1910: 36 (Mallota). Type locality: Altai-Beresowski (W Siberia). Becker, 1894, Nova Acta Avad. Caesar. Leop. Carol., 62 (3): 371 (Chilosia). Type locality: Not cited (Europe). = flavoscutellata Shiraki, 1968, Fauna Japonica, Syrphidae, 2: 66 (Cheilosia). Type locality: Shikotsuko, Hokkaido, Japan. 正))Type locality: Blagodatnoye, (Russia) and Fukui, (Japan). 誤)分布：本州，四国，九州; ロシア極東部（沿海州）. Distribution: Honshu, Shikoku, Kyushu; Primorye. 正)分布：本州，四国，九州. Distribution: Honshu, Shikoku, Kyushu. 大原賢二・山本栄治, 2000. 小田深山のハナアブ科. 小田深山の自然II 907-931. 桂 孝次郎, 2000b. 屋久島のハナアブ科調査報告 はなあぶ 10:88-94. 高倉康男. 1981. 福岡県のハナアブ(1). 北九州の昆虫. 28(3):143-151. 高倉康男. 1983. 福岡県のハナアブ(4). 北九州の昆虫 30(1):27-33, Pl.2. Mutin, 1988, Nov Maloizvestiye Vidy Fauny Sib. 20:130 (Neocnemodon). Type loaclity: Primorye Territory. 飯島一雄・川原 進, 2009. 北海道東部の双翅目-ハナアブ科(2). 標茶町郷土館報 21:79-99. Violovitsh, 1975, Nov. mal. vidy Fauny Sibiri. 9:80 (Chrysotoxum). Type locality: Primorskiy Kray, Eastern Siberia, Russia. 分布: 本州，九州; 韓国.ロシア極東部. Distribution: Honshu, Kyushu; Korea, Russian Far East. Sang-Wook Suk & Ho-Yeon Han, 2013. 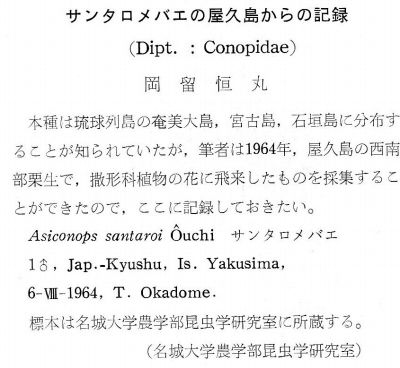 Clarification of previously confused Chrysotoxum sapporense and Chrysotoxum graciosum (Insecta: Diptera: Syrphidae) in East Asia based on morphological and molecular data. Animal Cells and Systems 17(4):277-289. Nagatomi, Liu, Tamaki & Evenhuis, 1991, South Pac. Stud., 12: 52 (Systropus). Type locality: Nakamagawa-rindo, Iriomote I. Type locality: Not cited. => Japan.